Summary Dual-drive Marvell-based NAS with USB 3.0 port, lots of upload/download options and support for add-in modules. If you’re in the market for a NAS device (Network attached storage) you have a few choices to make: How much storage do you need? How many drives do you want? Do you want the drives pre-installed, or do you want to by a bare chassis and supply your own drives? For many SmallNetBuilder readers, the BYOD option is often the best bet. Though there are quite a few NASes from manufacturers such as Buffalo Technology, Seagate, Iomega and Western Digital that come with drives pre-installed, often you’ll find that BYOD NAS products offer you a lot more features. With drive sizes now at 4 TB, a two drive NAS can be a great choice for home user. Unless you're a media junkie, it will take you a long time to fill up 4 TB and the option of RAID 1 mirroring can provide a bit more peace of mind for data security. Of course, you'll also need a separate backup device, preferably off-site, for true data security. All dual drive NASes offer the option of RAID 1 (mirroring) to provide in-NAS data redundancy. 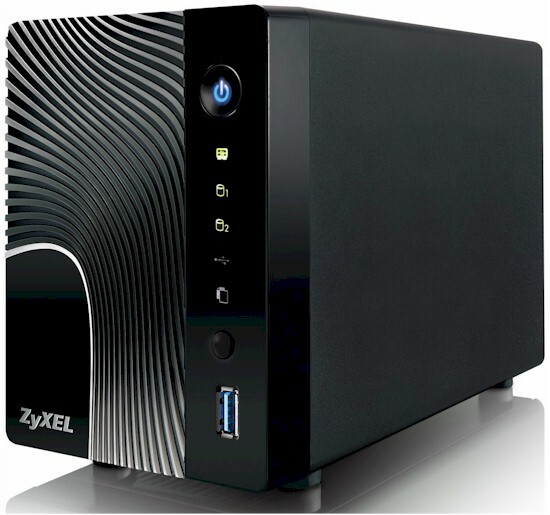 Some, like the ZyXEL NSA325 in this review, even provide you with root access. Linux guys can go crazy without having to hack in. The NSA 325 is an attractively designed NAS measuring 4.25” X 8.07” X 5.79”. The removable front panel features a molded in design which makes it look a little different than the traditional “black box” NAS. The front panel is attached to the case with three tabs and two small magnets hold the panel in place. The figure below shows both the front and rear panel configuration. On the front panel, there are status indicator lights for hard drives, the front panel USB 3.0 port, Copy and a System status light. The rear panel includes two additional USB 2.0 ports for additional storage, UPS monitoring or print sharing. Indicator lights on the Gigabit Ethernet port show traffic and link speed. The figure below shows you a description for each of the status indicator's colors and states.